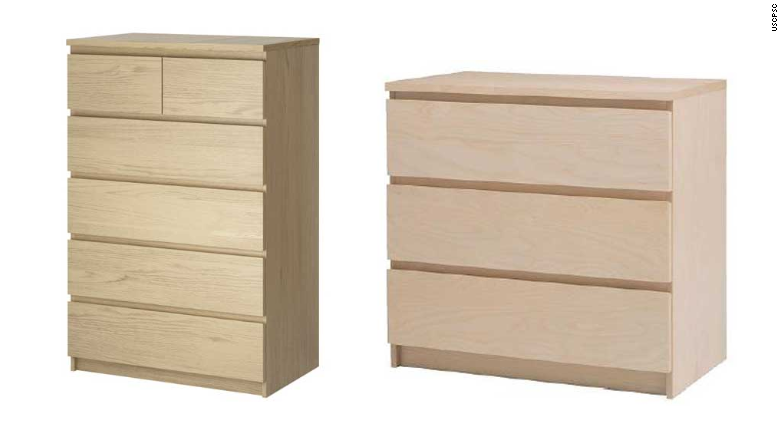 Two children died after unsecured Malm drawers fell on top of them. Ikea is issuing free anchoring hardware as a fix. Ikea is giving away free fixes for its drawers and dressers after two children were killed when the drawers fell on top of them. The furniture maker issued a repair program in conjunction with the U.S. Consumer Product Safety Commission, providing free anchoring kits to anyone with children's drawers taller than 23½ inches or adult dressers and drawer chests taller than 29½ inches. It's not a recall -- the products came with the anchoring kits included. But after two deaths, Ikea wanted to provide free kits to the 27 million people who purchased qualifying chests of drawers or dressers. The free kit includes replacement tip-over restraints, wall-anchoring hardware, instructions and warning labels to be affixed to the furniture. In February 2014, a 2-year old boy from West Chester, Pennsylvania, died after an Ikea "Malm" six-drawer chest, measuring 48⅜ inches high, tipped over and pinned him between the drawers and his bed. And In June 2014, a 23-month old child from Snohomish, Washington, died after a 30¾ inch Malm chest of three drawers tipped over onto the child.